Before diving into the suggested practices for looking at student work, it is important to consider the broader practice of documentation. 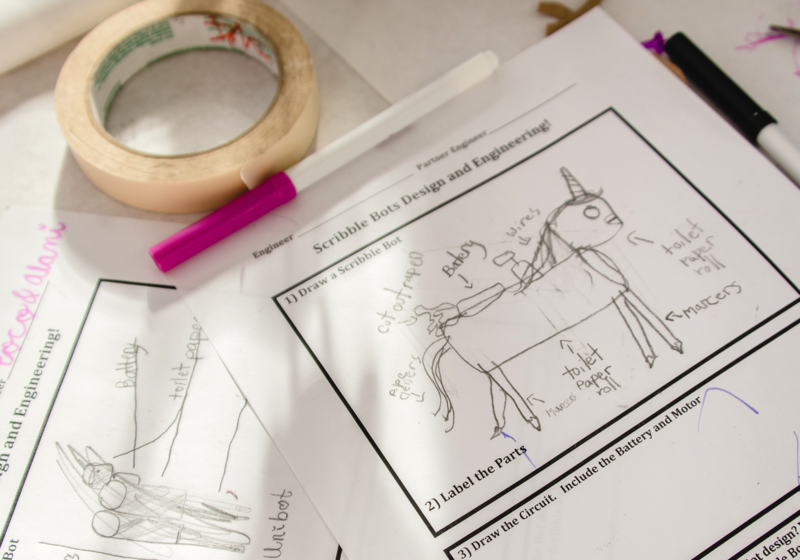 Documentation of student learning in a maker-centered environment can include documenting a vast and varied array of made products along with artifacts that capture the processes involved in the creation of those products. These artifacts, also know as student work, represent learning that is often interdisciplinary in nature and that demonstrates the degree to which students have come to understand content knowledge and/or mastered specific skills and dispositions. Collaboratively examining documentation of learning that includes both student’s products and processes offers an opportunity for educators and learners to reflect on learning and plan for next steps. The Agency by Design approach to documentation in the maker-centered classroom is grounded in the concepts presented in the book Visible Learners: Promoting Reggio-Inspired Approaches in All Schools (Visible Learners). Here, Project Zero researchers define documentation as “the practice of observing, recording, interpreting, and sharing through a variety of media the processes and products of learning in order to deepen and extend learning.” Throughout the Visible Learners text, the authors present a detailed approach to documentation, along with useful tools for educators. Below are two tenets of effective documentation, adopted from the Visible Learners text, that are particularly resonant with maker-centered learning. Educators engaging in the process of documentation may feel overwhelmed when considering exactly which moments of student learning to record — and how. Rather than attempting to “record everything” educators should take an approach to documentation that is purposeful and intentional. To satisfy this approach, documentation should be driven by a guiding question. Once educators have a question in mind that they would like to explore they can observe and record moments of teaching and learning that are pertinent to that question. 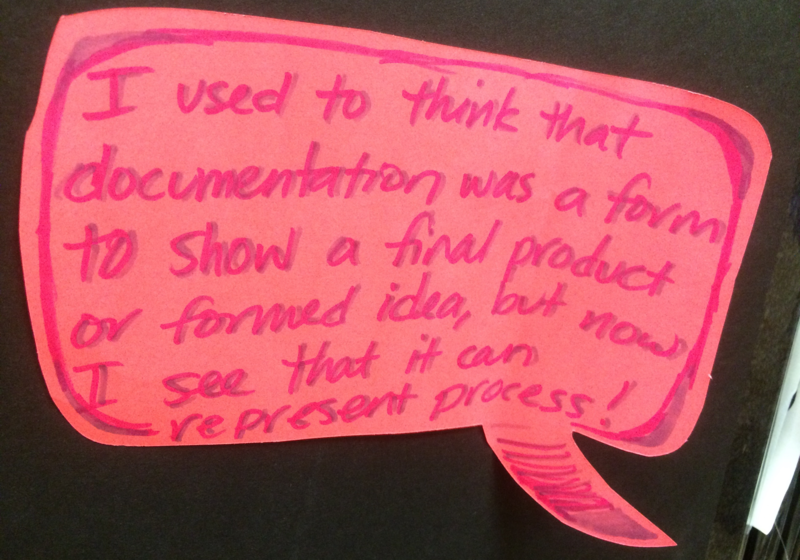 Effective documentation is both retrospective and prospective. In other words, engaging in the process of documentation helps us understand what students have learned by making their thinking and learning visible, but it also functions as a tool to further support students as they continue their process of thinking and learning going forward. 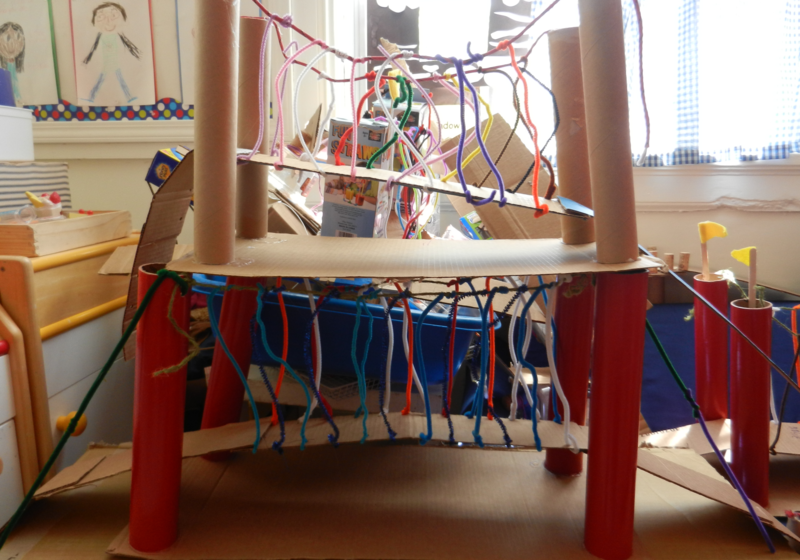 Maker-centered learning can feel messy. In reality, it takes considerable time and planning to design and facilitate interdisciplinary, inquiry-driven, hands-on learning. 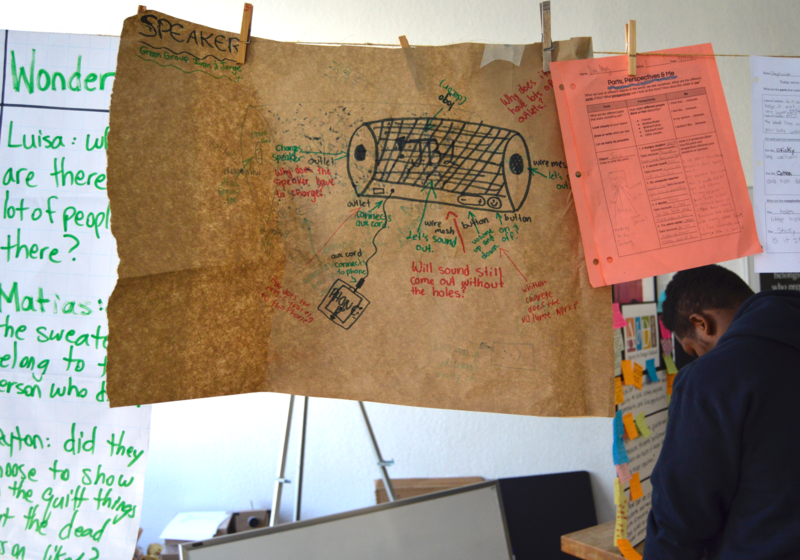 The maker-centered classroom is lively and multidimensional. It can —understandably—be challenging to capture the process in these dynamic environments. Taking the time to interpret and then share the products and processes that occur in these spaces is a vital step towards assessing learning and planning forward. 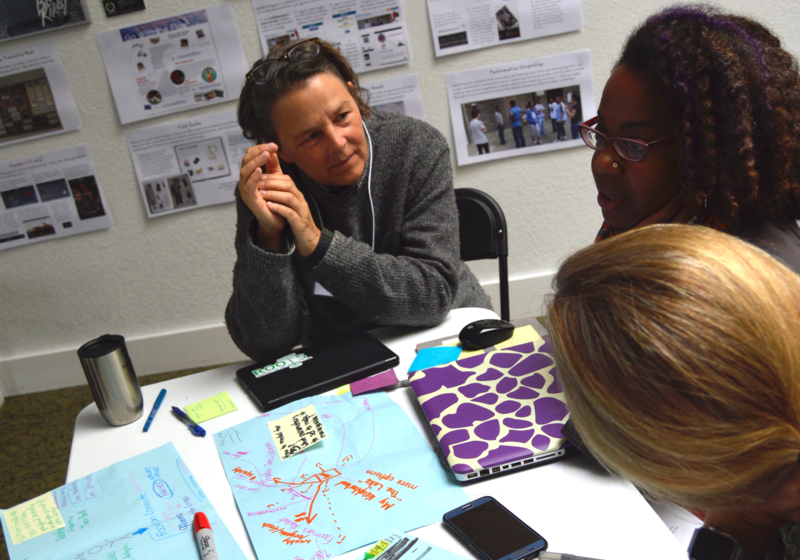 Below are some suggested practices for integrating a collaborative documentation practice. Looking at student work takes time and needs to be scheduled into your practice. Include it as a component of class time if you are reflecting on learning with your students or as a part of professional development time if you are getting together with colleagues. Or, if for whatever reason, it isn’t feasible to work the practice into a professional development experience, set up more informal meetings with one or more colleagues to look together at student work whenever you can. Will you look at final products or artifacts that share a portion of the process? 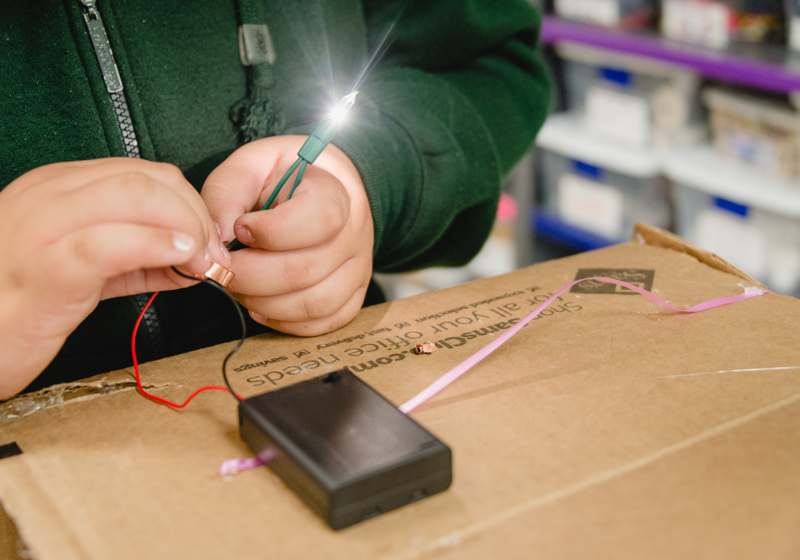 What are you hoping to understand more about: the knowledge, skills, dispositions, or something else, connected to a maker-centered activity? Do you want to focus in on one learner or a small group? Do you want colleagues to support you in critiquing an activity you just tried or do you want to have colleagues provide feedback on something you are designing for your learners to do in the future? Draft an agenda, set up some community agreements that you are your group abide by, and use a protocol. A protocol is a designed process for looking at student work. 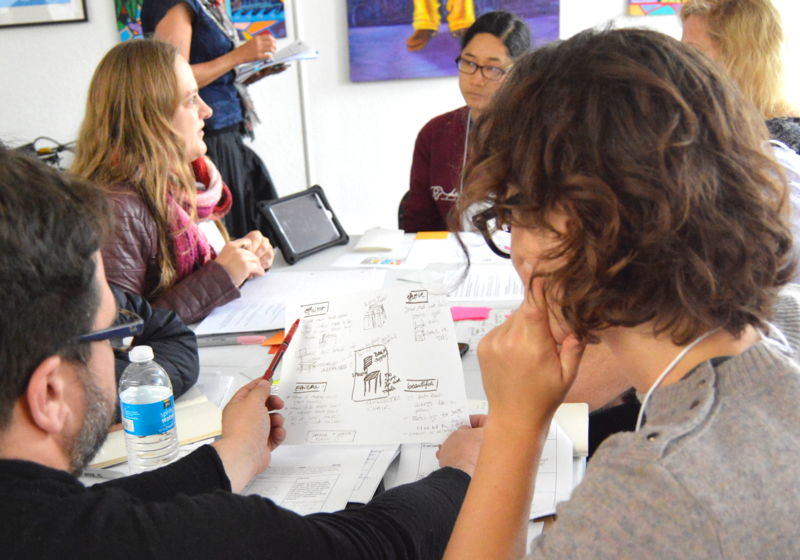 Agency by Design offers a protocol (link to resource page) on the tools page. Some educators in our research cohorts adapted this protocol so they could use it with their learners one on one and for learners to use it with their peers. Other educators redesigned/remixed the Agency by Design protocol with elements from different protocols to suite their goals for looking at student work. The School Reform Initiative website has many protocol examples to check out. To learn more about using protocols, we suggest: The Facilitator’s Book of Questions: Tools for Looking Together at Student and Teacher Work, by David Allen and Tina Blythe, as a helpful resource. Once you have considered your goals for looking, decide who would be the best collaborators to join you: other educators, students, parents, administrators, or other community members. Whether you are looking with others within your learning community or outside of the community will influence your planning. You may need to provide time and structure to share contextual information with those outside of the learning community and of course you will need to either receive permission from your learners to share their work or make their products and artifacts anonymous. Now that you have invested the time to look at student work and invited others to join you, take a moment to gather documentation and any notes from these sessions to serve as a starting point for the next moment when you can look with others at student learning. Focused sessions of examining and interpreting documentation are important parts of the learning process for educators and students. After this process there is a well-deserved opportunity to celebrate! Often celebration takes the form of sharing the processes and products with others. Sharing student work inside or outside of the learning community can be done through gallery-style events or though digital venues. At this point, documentation can be annotated with reflections from educators and learners that invite the audience to engage with the entire learning process from conceiving to making to reflecting on learning. Two tools that we have developed for documenting and assessing student learning in the maker-centered classroom include the Inquiry Cycle and the Observation Protocols for the Maker Capacities. A handout of the Agency by Design protocol for looking at student work can be found here.